Dynamic nuclear polarization (DNP) allows one to open new avenues for medical diagnosis, biochemistry, and perhaps even for physics. The polarization of nuclei in glassy samples that contain paramagnetic impurities and that are frozen at about 1 K in a magnetic field of 6.7 T can be boosted to ca. 70 % for protons and 40 % for carbon-13 nuclei, corresponding to spin temperatures in the vicinity of 10 mK. 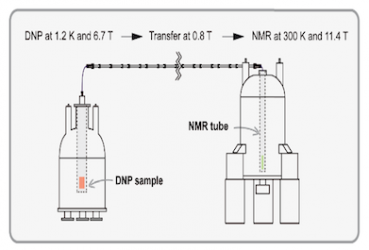 Rapid heating, dissolution and transfer of the "hyperpolarized" samples to MRI or NMR systems allow one to observe signals that are amplified by 4 to 5 orders of magnitude compared to conventional MRI or NMR at room temperature. One can also combine DNP with specialized methods for solid-state NMR such as ’magic angle spinning’ (MAS) by using powerful microwave sources known as gyrotrons. We shall give an overview of the research that we plan to carry out in our new laboratory that will soon be inaugurated at ENS. Biography : Geoffrey Bodenhausen is a member of the faculty of the Département de chimie, Ecole Normale Supérieure and of the Ecole Polytechnique Fédérale de Lausanne. He studied at ETH in Zurich and obtained a D.Phil with Ray Freeman in Oxford, worked with Bob and Gitte Vold (UCSD), Bob Griffin (MIT), and Richard Ernst (ETH, Nobel laureate 1991). He holds a PhD ’honoris causa’ of the university of Stockholm, is a fellow of the American Physical Society, and a corresponding member of the Royal Academy of Sciences of the Netherlands. He has recently been awarded grants by EQUIPEX and the ERC.